Don't forget the PVC bounce house and pit bals. Kids of every age love jumping, sliding, and dunking these colorfull balls while playing in the bounce house! 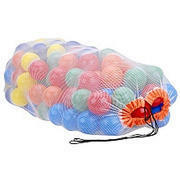 At only $5.00 to rent a bag of 100 balls how can you go wrong? Floss Sugar for use in Cotton Candy Machine. $20.00 per carton. Each carton yields 60-70 cones of cotton candy. Choose from Blue Raspberry, Cherry or Pink Vanilla. Note which flavor you would like in customer comments. Great Northern Commercial Quality Cotton Candy Machine. Large size drawer with three grids for storage, Volt controller and-volt display, Works continually and yields one cotton candy cone per 30 seconds and so simple to use: Turn on the motor and warm up for 2 minutes. Free delivery with Bounce House order. This is a great addition to any party!